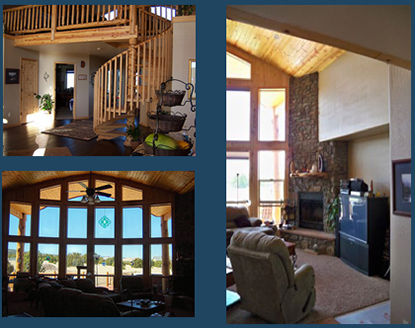 The Lakeview Model was designed for grand views and livable spaces. For a complete printer-friendly model brochure, including the FLOOR PLANS and MATERIAL LIST, download this PDF. 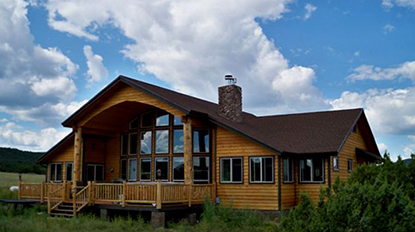 To view the pricing of this beautiful signature series log home, visit our model pricing page located here. The comfortable front porch allows a casual entry into a foyer that opens up into a truly striking great room with unlimited views through floor to ceiling windows to a focus view beyond, perhaps a lake, hence the name. The barrel-vaulted wood ceiling extends from the loft through the great room and over the covered porch in the rear of the house, lending a grand view and stunning impact on the common living spaces. The kitchen and breakfast areas are an integral part of this space and occupants become a part of the interaction taking place, not abandoned in a separate room. The elegant master suite allows for the privacy and luxury of a five star resort. Interested in this home? Contact us today for more information! Copyright © 2016-2019, Contemporary Log Homes, LLC. All rights reserved. Webmaster: Internet Marketing Resources, Inc.